Toyota's own Scion xD, which is closely related to the Yaris hatchback, comes with a larger engine and many more standard features, at an only slightly higher price. The Yaris is now one of the oldest designs in the small-car market, and while in Liftback form especially it still manages to look quite stylish on city streets, its interior comfort and feature sets are decidedly behind the curve among small cars. The two body styles of this model clearly cater to two different classes. 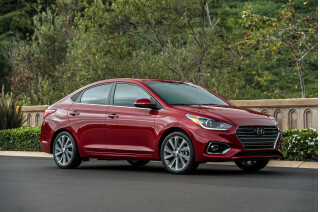 While the sedan is slightly more conservative in its trims and interior treatment—and looking the most dated at this point, the three- and five-door Liftback models are more flamboyant, with a more pert, aerodynamic look; European design influences; and a rear roof spoiler atop the hatch. In short, we think the Yaris sedan is trying a little too hard to appear as a mini-Camry. Inside, the Yaris has a very unconventional look, with a center-mounted gauge cluster and Liftback models offering large storage areas behind a slim center stack of controls. The interior is a contrast of elements good and bad, desirable and tacky, as Toyota obviously is trying to make a fashionable cabin while watching its price very carefully. While the 106-horsepower output from the sole 1.5-liter four-cylinder engine in the Yaris might seem low, it turns out to be perfectly adequate for all but a full load in this lightweight (2,300 pounds, or a bit more) small car. The engine works quite well with the five-speed manual gearbox, which has a light, easy clutch and decent linkage, or with the four-speed automatic, though it's a bit louder with the automatic. With the manual especially, the Yaris can be quite enjoyable to drive at low city speeds, but it's simply not as frisky as a MINI Cooper or Honda Fit, because of a suspension that's clearly tuned for ride, not handling. While the steering is nicely weighted, the Yaris leans and feels overwhelmed on tight, curvy roads. Depending on your size and shape, and type of driving, you might find the 2011 Toyota Yaris comfortable enough, or bordering on tortuous. The Yaris has exceptionally short front-seat cushions, which gives little support for taller occupants, and there's little or no side support for curvy roads. That said, there's enough headroom and legroom in front, while in back two average-height adults should just be able to fit—with splayed legs, perhaps. 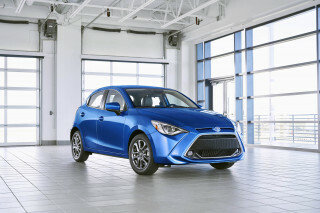 The Yaris Liftback models ride on a very short, 96.9-inch wheelbase and are among the shortest new vehicles; at about 150 inches long, it can get pitchy or bouncy on certain types of roads. It's ideal as a commuter that can fit into the tightest parking spots, yet handle longer trips when the need arises. Getting more intimate with the Yaris, you'll notice an interior that's obviously been affected by cost-cutting. While the instrument panel looks quite good from a few paces away, it's actually made of hard, easily scratched plastics, and the central gauge cluster is a novelty that few will find more intuitive or helpful. Front seats are rather small and skimpy, while the backseat on the Liftback is tough to get into but decent for space; kids should be just fine back there. The sedan looks like it might be roomier for back-seat occupants, but it's really not; it does, however, have a surprisingly spacious trunk. Many automakers have been trying to get away from the old 'economy car' image, by equipping their smallest cars with some of the conveniences of larger vehicles. But the 2011 Toyota Yaris isn't one of them; it can't be equipped with leather seats, or even heated ones, and there's no factory Bluetooth connectivity (it's a port-installed add-on). The Yaris is a simple car with a simple lineup—and a single model offered for each body style and transmission. Thus, there isn't much to report with regard to high-tech options or extravagant features, although iPod connectivity, XM satellite radio, cruise control, and various appearance upgrades are among the options. 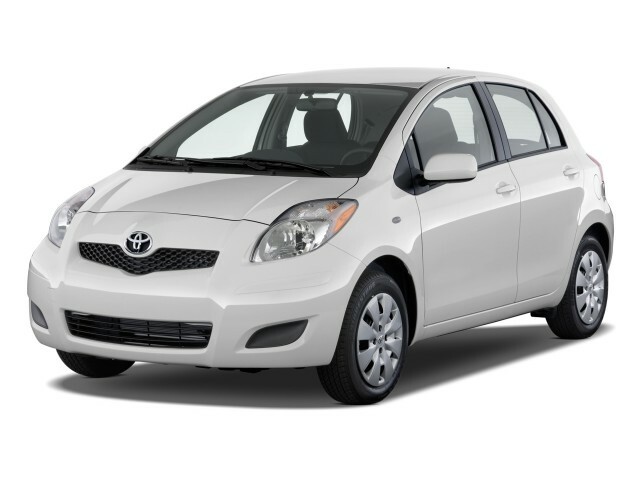 The 2011 Toyota Yaris Liftback models still have an eye-catching urban look, while the sedan looks its age. The Toyota Yaris is now one of the oldest in the small-car market, yet its design was well ahead of its time in some respects and it still looks stylish compared to some other models in this class. The two body styles of this model clearly cater to two different classes. While the sedan is slightly more conservative in its trims and interior treatment—and looking the most dated at this point, the three- and five-door Liftback models are more flamboyant, with a more pert, aerodynamic look; European design influences; and a rear roof spoiler atop the hatch. In short, we think the Yaris sedan is trying a little too hard to appear as a mini-Camry. Those who want to make the package appear a little more dressed up and buff might consider the Sport Package, which adds sport seats, larger wheels, a mild body kit, and a leather-wrapped steering wheel and shift knob, all resulting in a different look for this econocar. A line of TRD accessories can also help the Yaris get over the economy-car hump. Inside, the Yaris has a very unconventional look, with a center-mounted gauge cluster and Liftback models offering large storage areas behind a slim center stack of controls. The interior is a contrast of elements good and bad, desirable and tacky, as Toyota obviously is trying to make a fashionable cabin while watching its price very carefully. The 2011 Toyota Yaris only feels at home in the city, where it feels frisky and turns on a dime. While the 106-horsepower output from the sole 1.5-liter four-cylinder engine in the Yaris might seem low, it turns out to be perfectly adequate for all but a full load in this lightweight (2,300 pounds, or a bit more) small car. The engine works quite well with the five-speed manual gearbox, which has a light, easy clutch and decent linkage, or with the four-speed automatic, though it's a bit louder with the automatic. With the manual especially, the Yaris can be quite enjoyable to drive at low city speeds, but it's simply not as frisky as a MINI Cooper or Honda Fit, because of a suspension that's clearly tuned for ride, not handling. While the steering is nicely weighted, the Yaris leans and feels overwhelmed on tight, curvy roads. The 2011 Toyota Yaris is quite spacious, though not so comfortable. Depending on your size and shape, and type of driving, you might find the 2011 Toyota Yaris comfortable enough, or bordering on tortuous. The Yaris has exceptionally short front-seat cushions, which gives little support for taller occupants, and there's little or no side support for curvy roads. That said, there's enough headroom and legroom in front, while in back two average-height adults should just be able to fit—with splayed legs, perhaps. 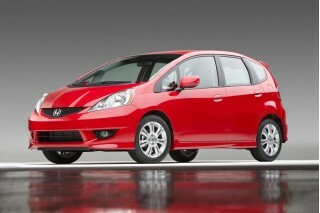 The sedan is nearly two feet longer than the hatchbacks, while its wheelbase is about three inches longer. However, seemingly little of that goes to back-seat space; the back seats in the sedan only seem marginally more spacious. The Yaris Liftback models ride on a very short, 96.9-inch wheelbase and is one of the shortest new vehicles, at about 150 inches long, it can get pitchy or bouncy on certain types of roads. It's ideal as a commuter that can fit into the tightest parking spots, yet handle longer trips when the need arises. The Yaris is better for road noise than other cars in this class, possibly due to the softer suspension calibration, but automatic models especially can feel somewhat boomy at higher speeds. The 2011 Toyota Yaris doesn't have class-leading safety ratings, but its list of standard safety features is impressive. The Toyota Yaris hasn't been particularly strong in safety, but Toyota has improved the package in the past couple of model years by making electronic stability control and anti-lock braking standard, as well as side and curtain airbags. To its credit, the Yaris is actually one of the few vehicles in its class of lowest-priced vehicles to offer the feature on every trim—even the base model. In Insurance Institute for Highway Safety (IIHS) crash-testing, the Yaris earned top 'good' ratings for frontal, side, and rear impact, but it was rated just 'acceptable' in the rollover-related roof strength test. The 2011 Toyota Yaris hasn't yet been tested under new, more rigorous crash tests and ratings standards introduced for this model year. Under the previous federal tests, the Yaris earned four-star results across the board. Luxury is a word unheard in the 2011 Toyota Yaris feature list; that's okay, but proper Bluetooth connectivity is sorely missing. Many automakers have been trying to get away from the old 'economy car' image, by equipping their smallest cars with some of the conveniences of larger vehicles. But the 2011 Toyota Yaris isn't one of them; it can't be equipped with leather seats, or even heated ones, and there's no factory Bluetooth connectivity (it's a port-installed add-on). The Yaris is a simple car with a simple lineup—and a single model offered for each body style and transmission. 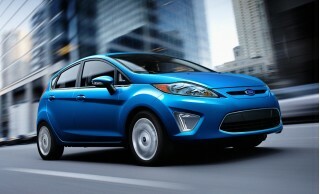 Thus, there isn't much to report with regard to high-tech options or extravagant features. The Yaris has a relatively simple lineup, with a single model offered for each body style and transmission. Although air conditioning and keyless entry are included in all models, unless you option up you'll get manual wind-up windows. Factory options are consolidated to just a couple of main option packages, along with a few standalone options. 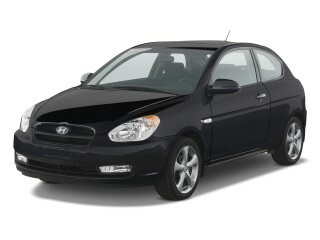 A Power Package brings power locks, windows, and mirrors, along with remote keyless entry (and upgraded trim in the sedan), while the Sport Package includes front and rear spoilers, side rocker panels, front fog lamps, an amber tachometer, front sport seats, a leather-trimmed steering wheel and shift knob, and an upgraded sound system with XM satellite radio compatibility, an auxiliary input, and iPod connectivity. 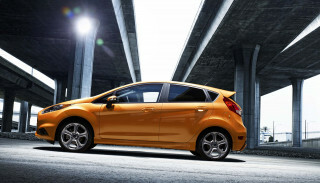 An all-weather package brings rear heater ducts and an upgraded windshield washer. 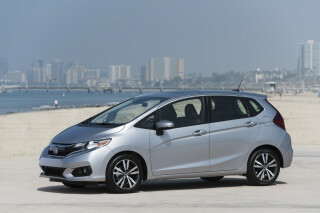 Fog lamps and cruise control are among the few items offered a la carte. Toyota also offers an array of accessories, available through dealerships, and while it's a very short list compared to what's offered in Scion vehicles (like the comparably sized xB), the Toyota Racing Development accessories are especially noteworthy. Suspension modifications, a sport exhaust, and 18-inch alloy wheels can all be supported as part of the factory warranty, when purchased at the same time as the vehicle. 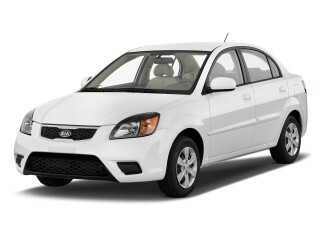 The 2011 Toyota Yaris is one of the greenest new-car choices; though it's no longer the greenest non-hybrid. The 2011 Toyota Prius gets excellent fuel economy. 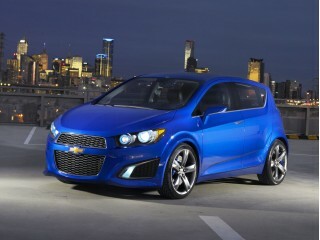 With EPA fuel economy ratings of up to 29 mpg city, 36 highway, it's one of the most fuel-efficient non-hybrid small cars. Our editors have seen great fuel economy in real-world drives—as high as 41 mpg in gentle driving, and about 33 mpg overall in our last drive of a Yaris automatic Liftback. 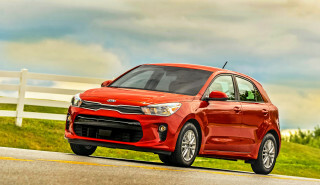 But this year, with the introduction of the 2011 Hyundai Elantra, Ford Fiesta, and Chevrolet Cruze—each of which achieves 40 mpg or more in some trims—it's no longer the best. There's no doubt that the Yaris takes less energy to assemble than the Prius; however since roughly 80 percent of a vehicles' carbon emissions profile pertains to its use, not its construction, you're still better off with a higher-mileage hybrid—or an electric—if you want to go green. As with my 1980 Toyota Celica it is a heck of a quality vehicle!